We tell you today the history of the most emblematic market in Madrid, the Rastro, and that is one of the most famous in the world. In the area that today occupies the Rastro and during the XV, XVI and XVII centuries, slaughterhouses and fur tanners were located, becoming a very bustling commercial area. In 1497 a slaughterhouse was inaugurated that, over time and after successive changes, would be transferred to the nearby Plaza de Legazpi. The name of “rastro” originates from the existence of the slaughterhouse, due to the traces of blood left by the animals after being sacrificed. In the middle of the seventeenth century, shops of carnage and tanners crowded with shops that made shoes, straps or mounts. Soon after they joined clothing stores, candle factories, etc. All of them businesses related to the slaughter activity. A few years later there were also sellers of food, bakeries, tools and objects of all kinds. Subsequently, the City of Madrid decided to transfer the skin tanners to prevent from contaminating the river with their activity. Already in the nineteenth century, antique shops, furniture stores, jewelers, books … also appeared in the Rastro. In this way, the market moved away from its origins around the slaughterhouse and acquired its own character. The writer Mesonero Romanos describes it in 1861 in his book “El antiguo Madrid” as a site “where old things of merit are sold in the middle of waste”. At present, the Rastro on Sundays and holidays is still very similar to the old one, although it occupies much more space than at that time. As a curiosity in 1902 King Alfonso XII erected a statue in honor of Eloy Gonzalo, a hero of the battle of Cascorro (Cuba). Although the square where the statue (today, the most emblematic of the Rastro) is located, was called Nicolás Salmerón, everybody still referred to that place as “Plaza de Cascorro”. Finally there was no other choice but to make the name official, which happened in 1941. 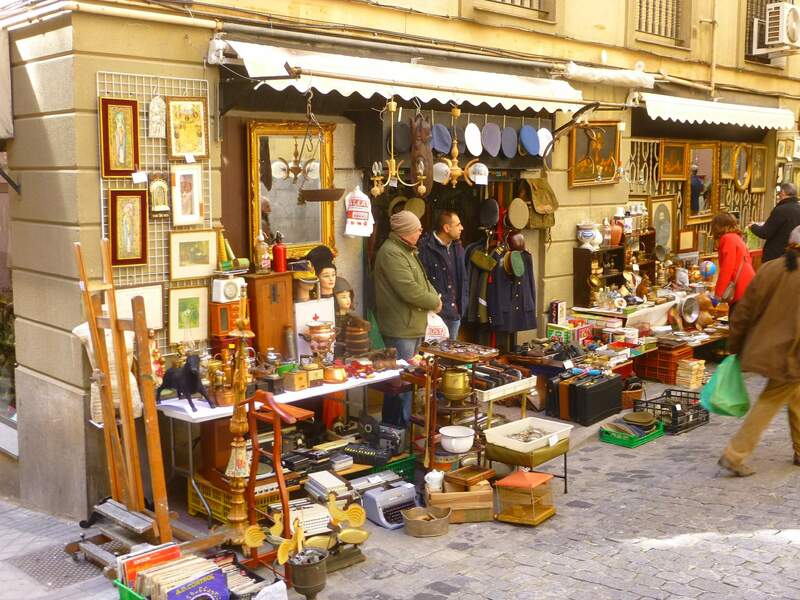 In the current Rastro there are some specialized areas depending on the objects that are most sold in each one. For example, the street of San Cayetano is known as the “street of the painters”, since there are several shops both of works of art and of utensils to paint. Or the street of Rodas, the Plaza of General Vara del Rey and the Plaza of Campillo del Mundo Nuevo, where several shops are dedicated to magazines and comics. Also, in the streets of the Carnero and in the one of Carlos Arniches are many old books. So you know, if you want a great plan for a Sunday or holiday, go first for the Rastro, and then go for an appetizer to El Anciano Rey, as tradition says.